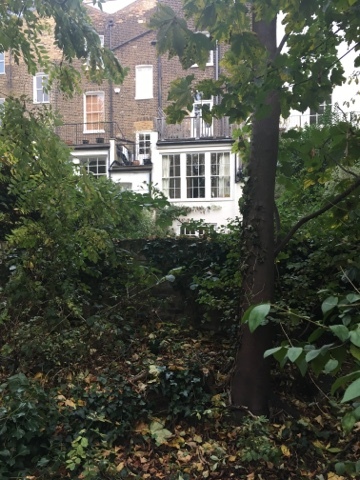 Tales from Duck Island Cottage: A Hidden Gem - London's smallest, secret wood. A Hidden Gem - London's smallest, secret wood. Sunlight filtering down through trees into a wooden glade in June. Peaceful and idyllic. Who would know that this picture is from a mature, natural wood, pretty much entirely surrounded by houses near the centre of London? It's to be found in Islington and it is one of the hidden gems we have chosen for a special quest for our visitors to gardens during the next Open Garden Squares Weekend in 2017. Visitors will be able to enter a new competition if they visit a designated number of hidden gems like this one. And the prize for the lucky winners will be tea at Duck Island Cottage, the picturesque cottage by the lake in St James' Park. 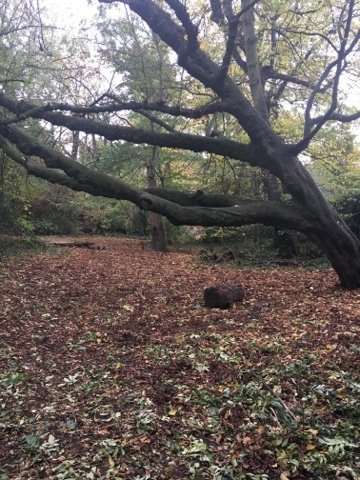 For the Islington and St Pancras area, Barnsbury Wood is the chosen hidden gem. 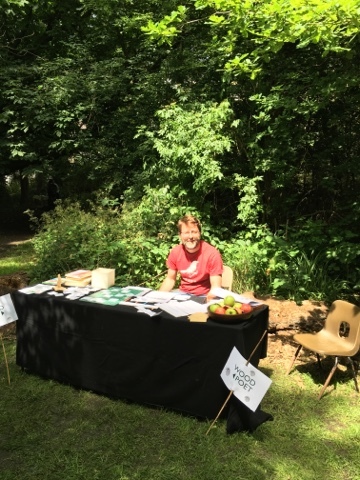 Last year, in addition to guided tours around the wood, Barnsbury Wood hosted a poet, one of several who spent the day in our gardens, providing a taste of poetry in addition to the delights of horticulture. He loved the wood and the visitors loved him. The entrance to the wood is through a gap in the terraces of houses which surround it. 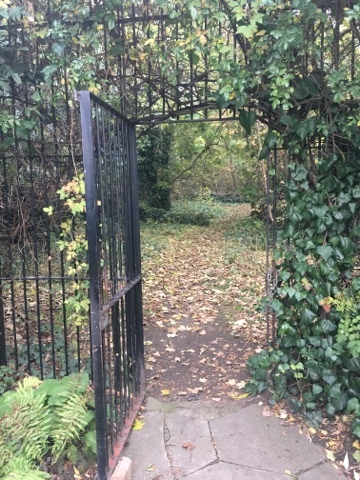 Until the mid nineteenth century the whole area was pastoral land, but in the 1840s the member of parliament for Huntingdon, George Thornhill, built houses around the nearby Thornhill Square, and the enclosed triangle of land, which today forms Barnsbury Wood was shown on the first ordnance survey map in 1971 as a private garden to 7 Huntingdon Street, where George Thornhill lived. By the turn of the century the garden was abandoned. The land was sold to a developer and in 1974 it was bought by the Borough Counci's Social Services Department, with the intention to develop it. Local residents then met with the Council in 1977-8 and it was agreed to keep the garden as open space. At this time it was entirely surrounded by houses, and entrance could only be gained through one of them. The Council owned the houses at 1 and 2 Crescent Street, which were squatted, but when the squatters were evicted, it was decided to demolish the houses in order to create access from the street for the first time. Another attempt by a new council to build houses over the wood was foiled by residents' protests in 1980-81 and since then the site has been very sensitively managed by the Parks Department, achieving Local Nature Reserve status in 1996, the smallest nature reserve in London, measuring a third of a hectare. A small nature reserve in keeping with its borough, Islington, which has the smallest amount of green space of any London borough. 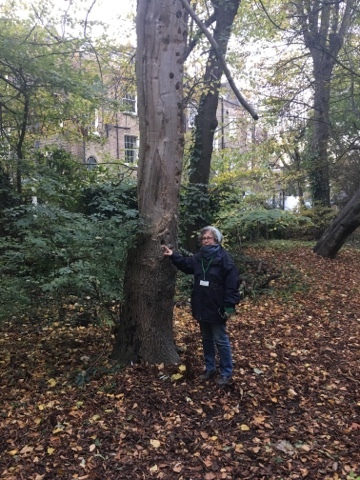 I met Louise Roscoe, Islington's Nature Conservation Officer with responsibility for Barnsbury Wood for the past 13 years, at the wood in November. The leaning horse chestnut tree from the opening photograph was a gaunt skeleton then, but still dominated over the entrance to the wood. She was accompanied by a new apprentice on his fourth day in the job, and together they were checking the wood for any litter, of which there was surprisingly little. The conservation staff seek to keep the balance between access to the wood and wildlife value. 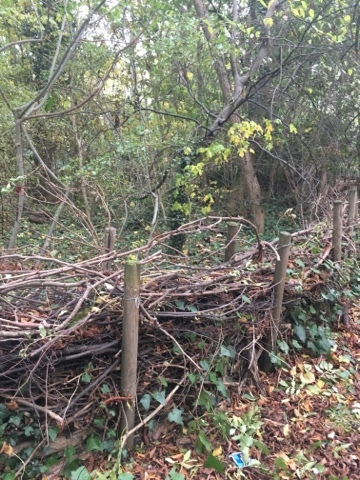 They have built some hurdles using dead wood to guard a circle in the centre from humans, where a fox lives, and have established good relations with the residents, who let them use water and electricity. Together they seek to safeguard the wood, with some residents volunteering help in its management. The residents did save it from development, after all. "The wood is always changing" explained Louise. Storms open up change as trees fall and are battered by wind. The trees are predominantly ash, with some sycamore, lime, cherry, wych elm, English oak and the horse chestnut, with hawthorn, elder, and hazel underneath. Conservation staff offer guided tree walks in the wood from time to time - I went to one a couple of years ago and learned a great deal about identifying trees, from their fallen twigs as much as from the trees themselves. Although dead trees fall and create space, they are sometimes allowed to stand, as standing dead wood is a delight for woodpeckers and other wild life. The tree above is a good example and Louise showed me what fun the woodpeckers have had boring holes into it. Fungi grow on dead wood and the chicken of the woods fungus, which stands out as a bright, yellow, orange, edible mushroom can be found here, as well as the bracket fungus on dead oak wood. There is a split oak tree in the wood which may end up completely dead too in the not too distant future. Logs which come from fallen dead wood are now often planted vertically deep into the soil and house lesser stag beetles. At the back of the wood the area was overrun with poplar trees. 40% have now been taken out and this has enabled a diverse array of wild flowers and bulbs to flourish. Lesser celandine, wild garlic and bluebells sprout forth in the spring. Last year sparrowhawks chose Barnsbury Wood for their nest. This circle was created after the space was created by fallen trees. It is now used for an innovative educational programme for adults and children. 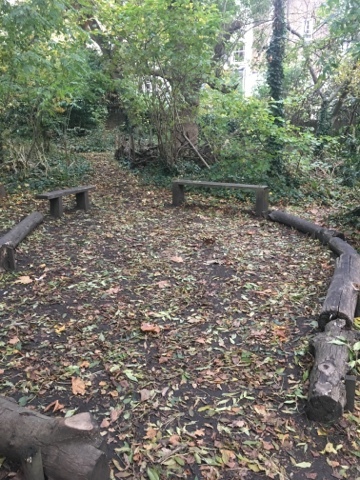 Barnsbury Wood works in partnership with a children's centre and a school which uses the principle of 'forest schools'. Forest schools originated in Scandinavia and believe in teaching children in the outdoors. Children come equipped in suitable clothing for the elements, make whistles from whittling elder tree branches, go bug hunting and learn a range of woodland skills in small groups of six or seven. There is also a therapeutic art group for adults recovering from trauma, singing classes and even an amateur dramatic society which will perform Shakespeare's A Midsummer Night's Dream next July. 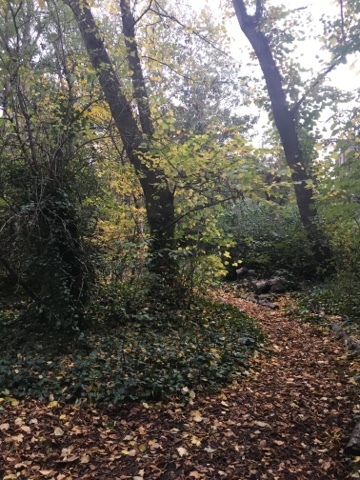 What joy it would be to live in a house with a wood at the end of your garden - to be able to walk into central London and enjoy the attractions of a great city as well as spotting toads in a beautiful wood! 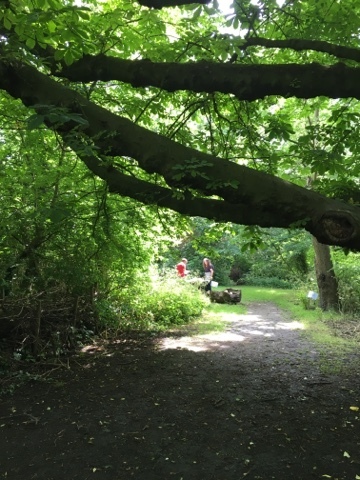 Barnsbury Wood is opened by volunteers every Tuesday afternoon, on Saturday afternoons in summer and on the Sunday of Open Garden Squares Weekend. Don't miss it in 2017. It is very special.